French writer/director/comedian Jacques Tati is often compared with Charlie Chaplin – despite his major films coming in the 1950s and 1960s, thirty years after the end of the silent era, Tati’s style of comedy is nearly silent, depending on sight gags and the empathetic persona of his character M. Hulot much as Chaplin depended on the Little Tramp. That comparison is well-founded, and since I love Chaplin, I assumed I would immediately love Tati. But my reaction to the first two Tati films I saw (M. Hulot’s Holiday and Mon Oncle, which are also his best-known) was mixed at best – I just didn’t really feel involved in them or care what happened. That all changed when I saw Playtime this year, and I’m really looking forward to rewatching his other films now. Playtime combines several threads of interweaving story, the most prominent of which is a group of American tourists in Paris. 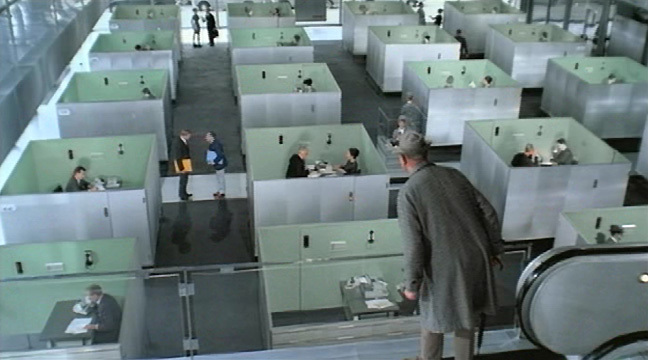 M. Hulot runs into them at various points – at the airport business offices, where he is unsuccessfully trying to get a problem fixed, at a sort of electronics trade show, and finally at a newly opened night club. Each of these locations (and a few others) are mined for every bit of comic action, but Tati has plenty of time for some incisive social commentary as well, especially on the rise of consumerism and artificiality. The entire film was shot on a giant replica of Paris that Tati built just outside of the real city – the expense of this endeavor mixed with the disappointing reception of the film devastated him financially, but it’s not hard to see why he did it. 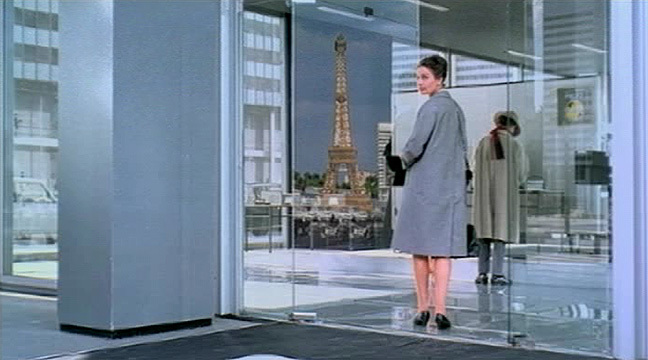 Throughout the film, the tourists joy at finding “the real Paris,” but they never actually do – they find replicas of the Eiffel Tower and the Arc du Triomphe (the real ones show up only in reflections in open doors, reflections most of the tourists don’t even notice), and they find street cart vendors who let them take staged pictures, but the real thing, the real gritty, grimy, living thing they wouldn’t know what to do with if they found it. Except for one woman who we kind of single out to identify with and who becomes the major connection to Hulot throughout the film. Meanwhile, Hulot gets pulled into sight gag after sight gag that are all the more hilarious because Tati lets them go on forever – long after most directors would’ve cut and gone on to something else. But Tati knows exactly how to pace this, and he lets every joke play out completely and wonderfully. He also uses space better than almost anyone else I’ve seen, shooting on 70mm, but not in widescreen, which gives a tremendous depth of field for shooting long-angle shots that let you seek out every corner with delight for something else he’s hidden there for you. I swear, you could watch this film several times, every time focusing on a different part of the frame, and see things you’d missed every time. Despite Tati’s tendency to use people almost as props rather than as developed characters and let the camera look on noncommitally as they bumble their way through the set, he achieves a great sympathy for his characters in Playtime, and a great depth of theme in his subtle commentary on the state of the modern world. Going back to the Chaplin connection, this is his Modern Times. Many might point to Mon Oncle for that comparison, which makes sense with Mon Oncle‘s setting in a mechanized house, but for my money, Playtime is his masterpiece, and mirrors Chaplin’s masterpiece in the themes of modernity and displacement within modernity yet with the promise of human connection despite the odds.